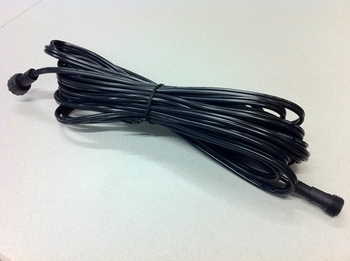 This new extension cable allows for simple extension of Aquascape lighting up to 25'. Ideal for use with our manual 12 Volt transformers and three way splitters. Use to extend IonGen further from outlet. From Carolyn of Colchester, Illinois on 11/17/2011 . 7/3/2014 – It this cable a 2 pin female to female extension cord. 10/13/2012 – What's the wires AWG?? 6/12/2012 – Does this extension cord work with the brinkman sure connect led landscape lights? I didn't see your answer to the previous . . .
3/30/2012 – I have a set of Brinkman LED lights that use a cable with two prongs and screw together. Male/female fitting. Can I use the . . .
2/6/2012 – i have two underwater ql-72c (rbg)outdoor 120v in 12v out.can i use this on my lights?? & still have red blue & green ??? . . .